The past week we’ve continued our quest to get all the skills into the game. This time, the third and final fire spell joins the fray! Its working name is Flamethrower, and it’s a close ranged, channeled spell which does massive damage to anything in front of you. Click on the image to view an animated gif! To use this skill effectively, positioning and timing are very important. You’ll want to be able to hit your enemies with the full channel without getting caught by flanking enemies, or hit by a counterattack in case the enemy is too tough to stunlock! The skill channel is both shield- and movecancelable, meaning you won’t be stuck if things get dangerous. The uncharged version will cancel if you move, but if you get the Silver Charge at level 5, you can move while channeling, enabling you to easier land the full damage. The Arena has felt a bit emtpy and dead for a while, so Fred have spiced things up with a live audience! The audience is a single 100×100 animated tile that can be looped seemlesly. Besides animation work, Fred put in a Arcade Mode session on his livestream this Saturday. For anyone intrested in seeing one of the devs getting stomped by Arcade Mode, you can check out the VOD by clicking here! Posted by Secrets of Grindea at 2014/01/28. Tags: Portraits, Screenshot, Skills, Weekly Recap. pssss.. I’m on the Beta list. What!? You don’t care!? How bout I introduce you to my friend George… George Washington. Thank you. I’ll be waiting for my invite tonight. How does Flamethrow differ functionally from the 1-handed sword multi-stab skill? Both seem to be short range rapid-hits. @J Well, the obvious thing I can think of to start off with is that one of them doesn’t require a 1h weapon. I don’t remember being able to move around with that attack either, but I don’t recall if I leveled it up past bronze. I’m glad to see other skills being implemented. Will all skills be shield cancelable? I remember not being able to with, hm, the whirlwind 2h attack, I think it was. Which made it less desirable to use. I like the flamethrower very much! @J: I think the multi-stab counds as a normal attack and the flamethrower as a magic one which is affected by things like for example the staff-weapons. And in addition, you can move while casting. It looks like the player is firing a Kamehameha Wave! Also I’m loving the crowd animation. Will there be a cheering sound in the background, though? @Caleb: A job well done! @J: As claudekennilol and Sogomn both said, one big difference is that Blade Flurry scales with ATK, and the flamethrower scales with MATK. Through charging, Blade Flurry evolves into more direct damage, while the flamethrower gets greater control. Having a wider aoe, the flamethrower also is better suited for handling multiple enemies, while the flurry usually works best on single targets! Awesome stufff as usual. I checked out the arcade mode video that Fred posted and it looks like a lot of fun. 1.) At 4:42 something strange seems to happen when the cloud is summoned. The mana bar ggoes to 100/80 ad then when Fredgoes to the next screen, it goes to 80/80 and stays that way until he dies. I thought the cloud was suposed to consume a section of the mana bar and not reduce it completely? 2.) 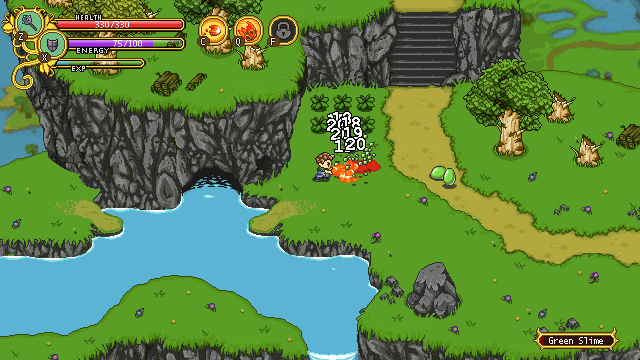 The circles around the enemies go under the splodges left by the slimes. I’m not sure if this is intentional but I think it would make more sense for them to go above. 1) That’s a bug! It does block out the mana, and it’s supposed to say 80/100 all the time!